Get twice as much Fire Cider tonic goodness in our apothecary-inspired, 16-ounce amber glass bottle. Whether you plan to give it as a gift or hoard it for yourself (we won't tell), you'll find this to be one of our most versatile sizes for spaces both large and small. What's in it and how's it made? We're glad you asked. Just like our 8-ounce original size, we toss a bunch of raw, organic, health-promoting ingredients like garlic, ginger, onions, horseradish, habanero peppers, turmeric, and citrus fruit to a base of raw organic apple cider vinegar. We let the vinegar extract all the plants' beneficial compounds and flavors, then mix in raw, organic wildflower honey to balance all that spicy tartness. It's a distinctive fresh-foods taste that's potent and energizing. 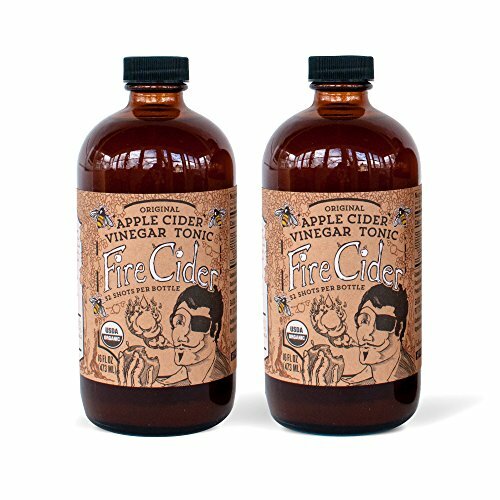 Fire Cider apple cider vinegar and honey tonic is shelf stable at room temperature for 18 months.